I was at the Chevy dealership, looking into purchasing a minivan because I now have two kids and the larger car we bought to suit having one kid just isn't good enough. 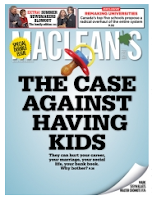 My girls were running around [not] not screaming, touching things, making demands, and as I followed them over to the waiting area, right there on the table, was the August 3 issue of Maclean's Magazine with the big bold words "The case against having kids." I know of a few people who have no interest in having kids, and at least one who has taken the steps to ensure it, after practically having to write an essay to her doctor to justify her decision. It is incredible how nosey and provocative people can be on the subject of having (more) kids. I even got it when I already had one, because apparently, it's improper to have just one. As one woman on a msg board said "They aren't chips." People have no idea what could be going on for the adults who are considering or not considering having children. There is a part of my brain that is wired to believe in the concept of procreation. To think that a person who doesn't want kids is selfish blah blah blah (an ironic argument that really makes no sense considering how selfish it is for some people who are not financially prepared for children to inflict those costs on everyone else). But I can easily push that aside for the sake of the far more important point: I would not want people who do not want children having them! We already have too much of that going on. And once I set my mind to this way of thinking, I have to praise those who have made this decision because they are being honest about it and not giving in to social pressure. Because really, giving in and having babies because it's the "right" thing to do? Yeah. Nuh uh. Why do we have children? Why did I have children? To be honest, I'm not sure I can give a specific reason. I just knew that I wanted to be a mother and it upset me both times the choice was potentially taken from me. Ultimately, if I wanted to stop and think about it, my reasons are a lot selfish, as is the case with many parents, I'm sure. Children are our answer to immortality. They are the opportunity to do the things we couldn't as children. They are much more than that, of course, and I do not for a moment, even when mine are being horrid and/or annoying little brats, regret their existence. But I certainly do not begrudge someone who chooses not to have children. That is there right, and more importantly, their decision is no one else's business. This is my mindspill. Mostly about comics, books, video games, movies of the science fiction and fantasy leanings. Sometimes recipes and parenting stuff will sneak in, along with a real world rant or two. I also write about geek culture at Women Write About Comics, and I review genre fiction at The BiblioSanctum. Visit Nightxade's profile on Pinterest. Wendy has read 9 books toward her goal of 100 books. Comics to Read, May 9 - It’s Alive!!! !